If you are looking for a great place to spend the day, head to Top of the Rock. Start your day off with a relaxing round of golf at one of several courses found at Top of the Rock. Experience a variety of courses, each with a different level of difficulty. These courses were designed by golf professionals to provide the perfect skill level, while offering some of the best views of the Ozarks. If you like history, the Ancient Ozarks Natural History Museum is definitely something to check out! You’ll see prehistoric creatures, collections of Native American artifacts, and large galleries featuring the American West and Civil War. After learning some history, head outside to take in some of the beauty of nature. The Lost Canyon Cave and Nature Trail provides guests with gorgeous views of Table Rock Lake, rock formations, and beautiful waterfalls. Be sure to check out the four-story cascading waterfall in Lost Canyon Cave! 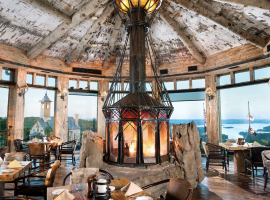 Osage Restaurant features rustic decor with rugged beams, iron chandeliers, and custom artwork. Their menu features a variety of options such as braised short rib, pan seared scallops, lamb, salmon, and more. Finish your meal here with their famous Ozark Mud pie or Gooey Butter cake! Arnie’s Barn features a large collection of golf memorabilia and overlooks the beautiful Top of the Rock golf course. Their menu offers delicious dishes such as taco salad, enchiladas, quesadillas, and cheeseburgers. Be sure to try their chipotle chocolate brownie or caramel flan! Buffalo Bar is a great place to enjoy a wood-fired pizza, delectable salad, halibut, fried chicken breast, and much more. They offer treats such as berry tarts, creme brulee, and Kentucky High Day pie! From exciting adventures to delicious meals, your day at Top of the Rock is sure to be remembered!